Shortly after 5 p.m., an officer stopped a vehicle in the 3200 block of El Camino Real for a mechanical violation. The driver gave then officers a false name. Officers searched the vehicle and found more than an ounce of methamphetamine, a loaded firearm, a laptop and more than $8,000 in cash. Both the firearm and the laptop had been stolen, according to police. Police arrested the driver of the vehicle, 55-year-old Larry Conway, a wanted parolee from Texas. Officers also arrested a passenger, 64-year-old Nancy Brown-Wolf. Conway and Brown-Wolf face charges related to possession of narcotics for sale, possession of narcotics while armed, possession of stolen property and conspiracy. 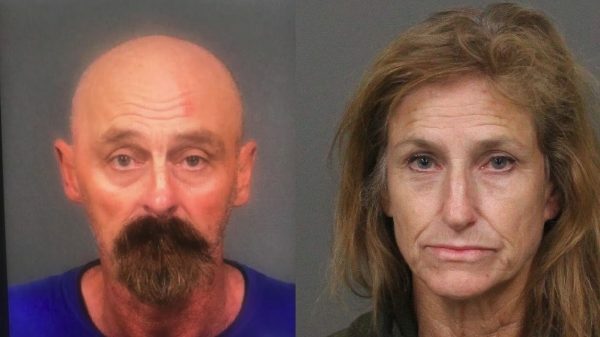 Officers booked both suspects into the San Luis Obispo County Jail, where they currently remain. Brown-Wolf’s bail is set at $50,000, while Conway’s bail is set at $51,500. And the award for best looking couple goes to Larry Conway and Nancy Brown-Wolf. Not! They sure do throw the charge of conspiracy around here. How about charging Bill Worrell, Charles Tenborg, Adam Hill and James Wagstaffe with conspiracy, Dow? You already have the proof.